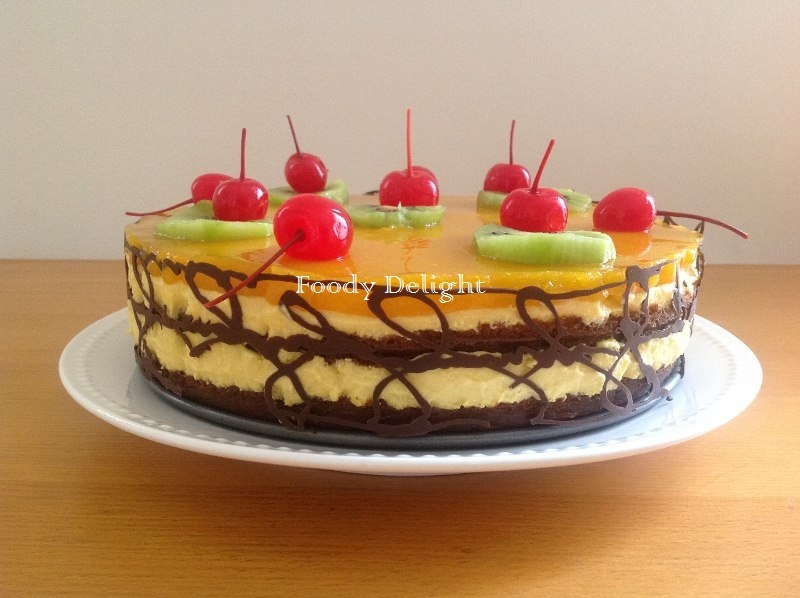 Mango mousse cake is the sponge cake filled with mango mousse which is quite spectacular. It looks difficult, but is easy to make using a springform pan. Sponge cake lines the bottom of the pan, which is then filled with the mousse and another layer of cake. The sponge cake is soaked with fruit flavored syrup or a simple sugar syrup , which compliments the delicate sweet-tart flavor of the creamy mousse. This is a cake that will wow guests. Beat sugar and curd together till mixture becomes creamy. add baking powder and baking soda to the creamed mixture. Mix well. Let the mixture set for 5 minutes and you can see the bubbles appearing. now add vanilla essence, cooking well and mix well. Then slowly add the flour in portions at a time and fold into wet ingredients. Meanwhile line up the cake tin using butter paper and pour the batter into the cake tin. Bake the cake for 25 to 30 minutes or till a fork inserted into the centre of the cake comes out clean. Allow the cake to cool down for 10 minutes, then invert and remove the butter paper. When the cake cools down completely, divide the cake into 2 slices and keep it ready to assemble. Peel the mangoes and separate the flesh from the seed. combine the mango flesh and sugar into a blender and make puree. 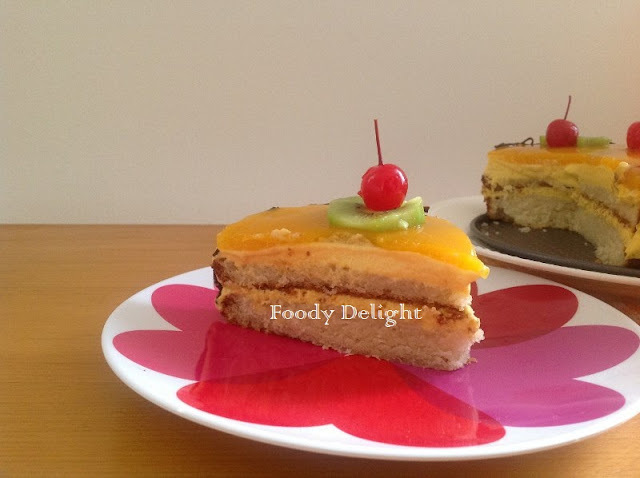 If using tinned mango puree, do not add additional sugar as the puree is usually sweetened. Add softened cream cheese to mango puree and whisk until combined. Now whip the cream with 2 tbsp of powdered sugar until the soft peaks are formed. 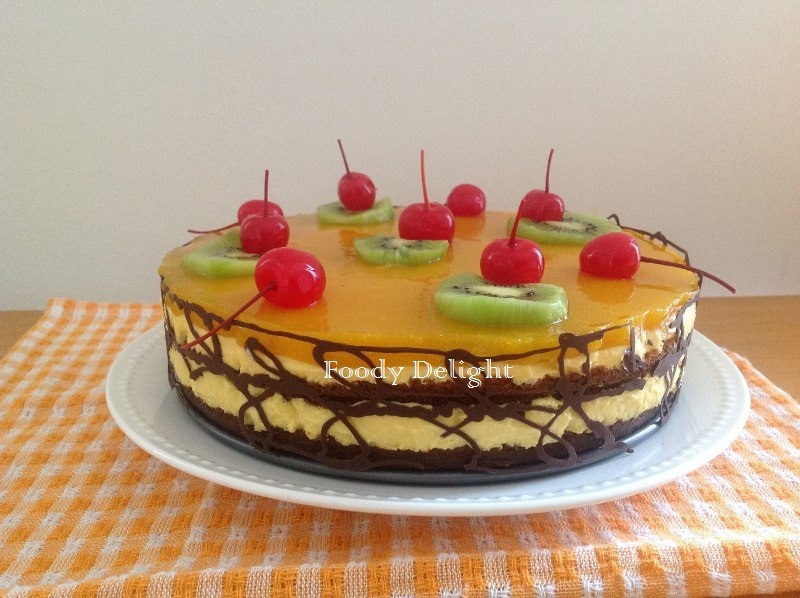 Mix in the whipped cream to the mango mixture. Soak the gelatin into 1/4 cup of water. Then heat the soaked gelatin mixture until melted and clear (heat in microwave for 20 seconds or use double broiler). Pour the melted gelatin mixture into mouse and mix well for 1 minute. Line the sides of 8 inch spring form pan with parchment paper. Place one layer of sponge cake at the bottom of the pan . Moisten the cake with 2 tbsp of soaking liquid. Pour 1/2 of the mango mousse and spread evenly using spoon. Place another layer of sponge cake over the mousse. Again moisten the cake with 2 tbsp of soaking liquid aand spread the remaining mousse . Refrigerate the cake for 2 hour until the mousse is set. In a bowl, add mango puree, 1/4 cup of water and sugar and heat over low flame till sugar is completely dissolved..
Strain the mixture discard any remaining threads. Pour the melted gelatin mixture into mango mixture and mix well for 1 minute. Gently pour the mango mixture over the cake(check that the mango mixture is not hot else it will melt the mousse layer and make a mess) . Refrigerate the cake about an hour until the jelly mirror is set . Once set, unmould the cake and gently peel off the parchment paper and decorate with some fresh fruits. Awesome & fabulous cake,loved it..yummy is just a small word,Pranjali...Deliciously done!! 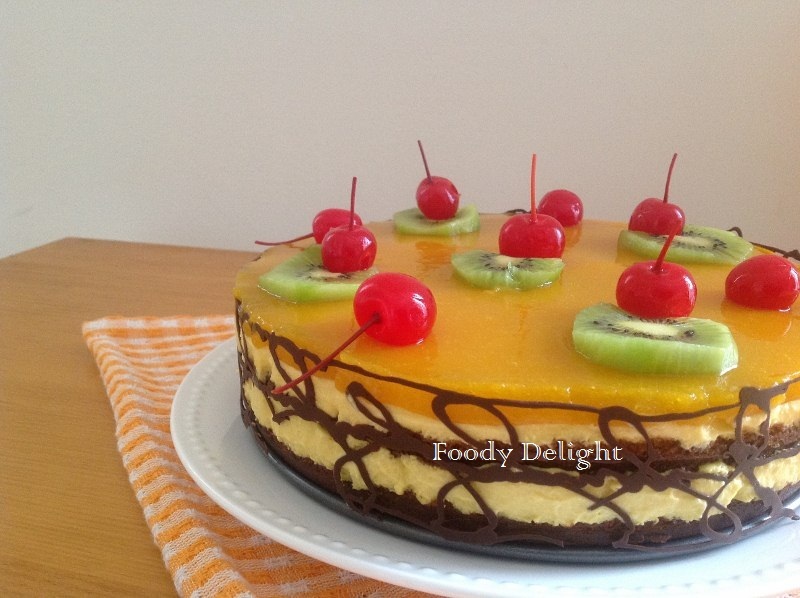 Gorgeous cake.......will definitely try it after Ramadan. A nice presentation cake and sound good!